US Congresswoman Sheila Jackson Lee says she was not aware of the arrangement, claiming a former staffer made the reservation without her knowledge. An event initially sponsored by a US lawmaker in the House of Representatives in support of the Boycott, Divestment and Sanctions Movement (BDS) has been canceled following the legislator's withdrawal, US Conservative publication The Weekly Standard reported Tuesday. According to the magazine, US Congresswoman Sheila Jackson Lee (D-TX) had originally reserved a room for the US Campaign to End the Israeli Occupation on Capitol Hill, before pulling out of the event following complaints by fellow Democrats. Jackson, for her part, denied any prior knowledge or connection to the event, which advertised the participation of "actual practitioners" of the BDS movement, according to the organizer's invitation. A spokesperson from Lee's office acknowledged that a room had been booked by a former employee in the congresswoman's office, but said that neither Lee nor her aides were previously aware of the arrangement. "That room was actually booked by a staffer that's no longer with us, back in March," Jackson Lee's communications director, Mike McQuerry, told the Standard. "This was done without the knowledge of anyone in the office." "We've taken our name off of booking the room," he continued. "We weren't involved with planning." Asked if the congresswoman supports or repudiates the BDS Movement, McQuerry said "I don't know anything about BDS as of yet." McQuerry added that Lee's office was currently focused on tracking the ex-staffer that made the reservation. Lee's office had originally denied any involvement in the event, with one top aide telling the Standard Monday "She is not the sponsor." 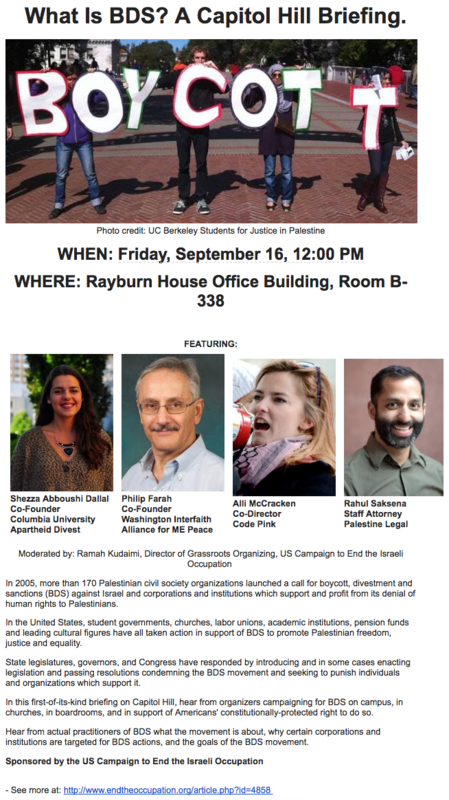 A list of lawmakers supporting the event has yet to be made public, the Standard noted, with an official at the US Campaign to End the Israeli Occupation saying, "We don't give out that information."